Devin Townsend is one of the most prodigious and prolific contemporary talents in the metal world, along with being one of the most admired and celebrated. Hevy Devy is a frequent visitor to these shores and will be once again returning to Australia’s east coast for three shows this October, with Periphery in tow as special guests. For almost 20 years, Devin Townsend has amazed, beguiled and occasionally baffled all comers in numerous incarnations, spanning the extreme noise metal of Strapping Young Lad to the intricate melodies of Ocean Machine. Devin has had his hand in almost every genre of music, from industrial metal to progressive rock to ambient sounds. All of these projects had one thing in common: genius. 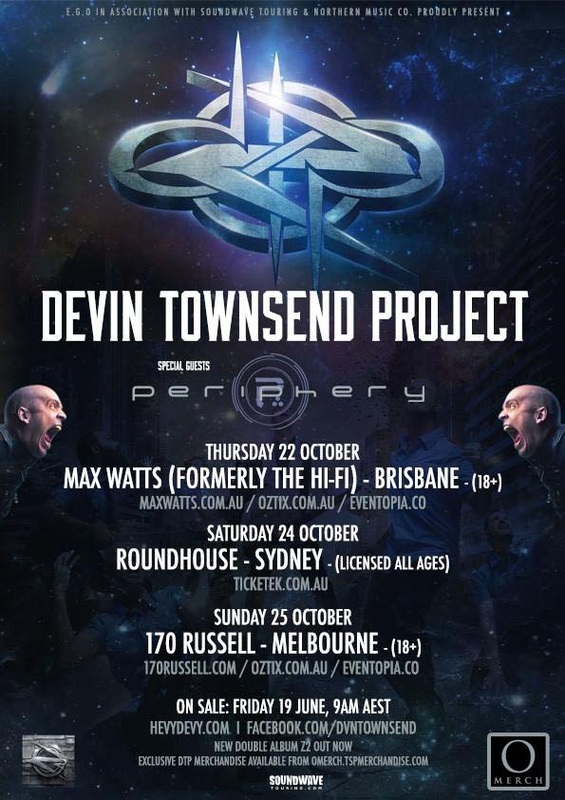 There are no more joyous experiences in modern metal than a Devin Townsend concert and on his upcoming October tour, fans can expect a career defining set, featuring songs from across his expansive catalogue. Periphery has defied the boundaries of conventionality, bringing new life to the metal scene. Their meteoric rise to the upper echelon of the metal world will be in full display when they return to Australia supporting Devin Townsend Project.